Move the front portion of the control knob up to raise or down to lower the front part of the seat cushion. 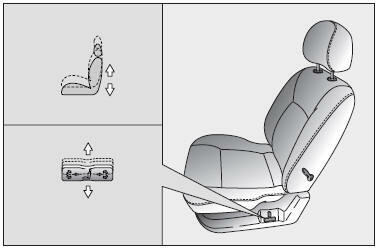 Move the rear portion of the control knob up to raise or down to lower the rear part of the seat cushion. To raise or lower the seat cushion totally, pull up and push down on the center of the corresponding switch. To minimize the risk of possible severe personal injury in the event of a collision, both the driver's and passenger's seatbacks should be in a normal seating position while the car is in motion. 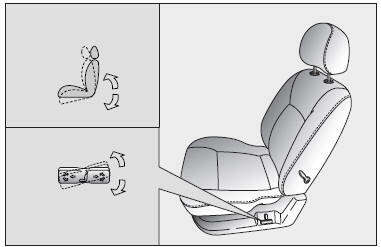 The protection provided by the vehicle’s restraint system may be reduced significantly when the seatbacks are reclined. All parts of the restraint system are designed to absorb energy in an accident and this can best be accomplished if the seatback is in a normal seating position and the seatbelt is in close proximity to the occupant.